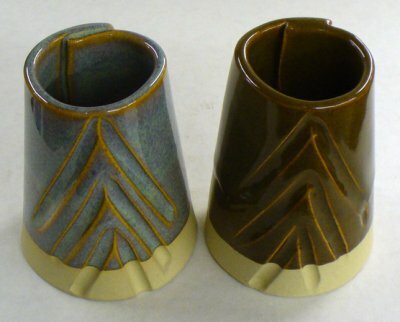 When ceramic melts are cooled they prefer to solidify as an organized molecular structure. Given sufficient time and sympathetic chemistry, they will form a crystalline structure. But if cooling is faster they solidify as a glass. 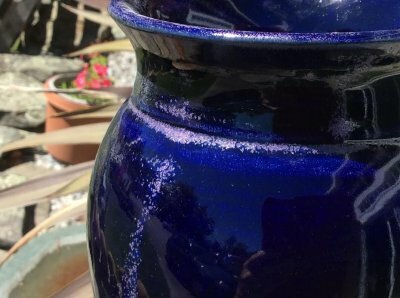 Crystals can grow in cooling glaze melts if one or more of the following conditions are present: the glaze melt is fluid, cooling rate is slow, oxides that like to form crystals are present (e.g. ZnO, TiO), oxides that can form crystals are present in high proportions (e.g. 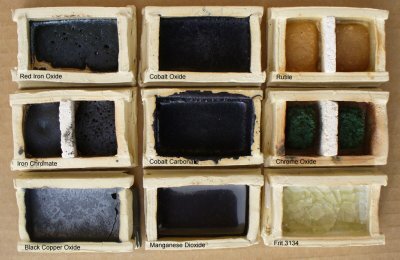 CaO, Fe2O3), oxides that stiffen the melt are not present or present in low percentages (e.g. Al2O3, Zr, MgO). Crystals are normally silicate or borate compounds, thus SiO2 and B2O3 need to be present in significant amounts. 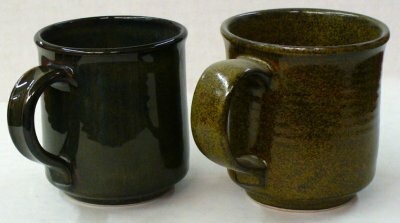 Crystals can be seeded by incorporating them in a glaze batch. 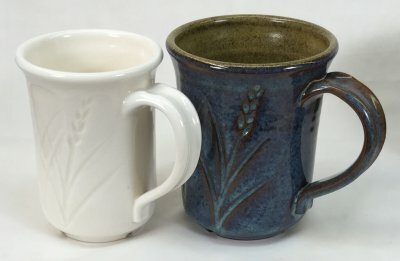 Glazes not normally prone to crystallization can sometimes be partially crystallized by slow cooling and glazes prone to crystallization can often be quickly cooled to prevent it. 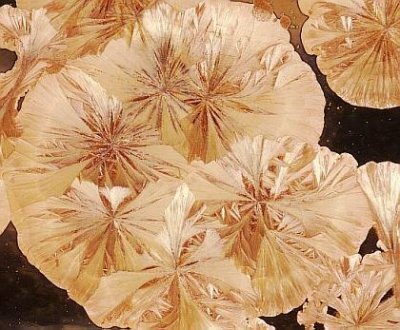 Crystallization can be highly decorative but is difficult to maintain consistency (and is thus often used in one-of-a-kind art ware). 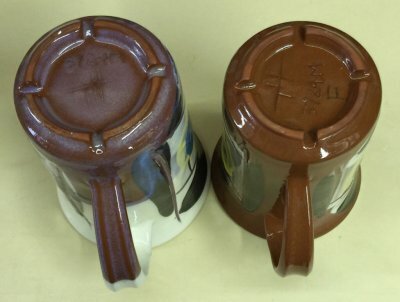 Unwanted crystallization occurring in a glaze during cool-down in the firing is called devitrification, it spoils gloss surfaces and can be a real plague to industry. It can be dealt with by faster cooling or adjustments to chemistry (e.g. higher Al2O3, switching some CaO for MgO, reducing B2O3). 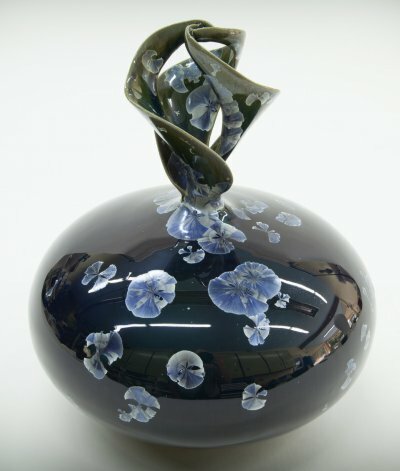 Very glossy or well-melted glazes can be subject to this because they likely either contain a lot of SiO2 (which combines with other oxides to form silicate crystals) or have a very fluid melt (which enables crystals greater freedom to form). When devitrification is desired it is simply called crystallization. 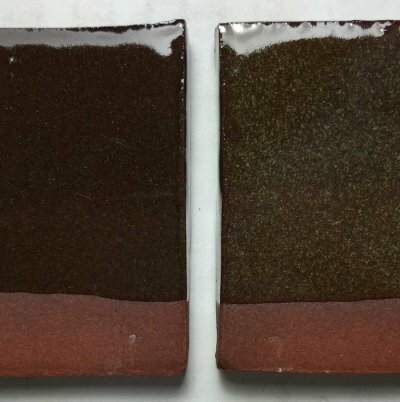 The chemistry of the host glaze is the key factor since it determines the amount of melting and the presence of oxides that are crystal-friendly or impede crystallization (e.g. Al2O3, MgO). 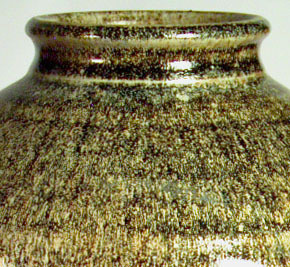 Many mattes are simply glossy glazes in which the entire surface has been invaded by micro-crystals. 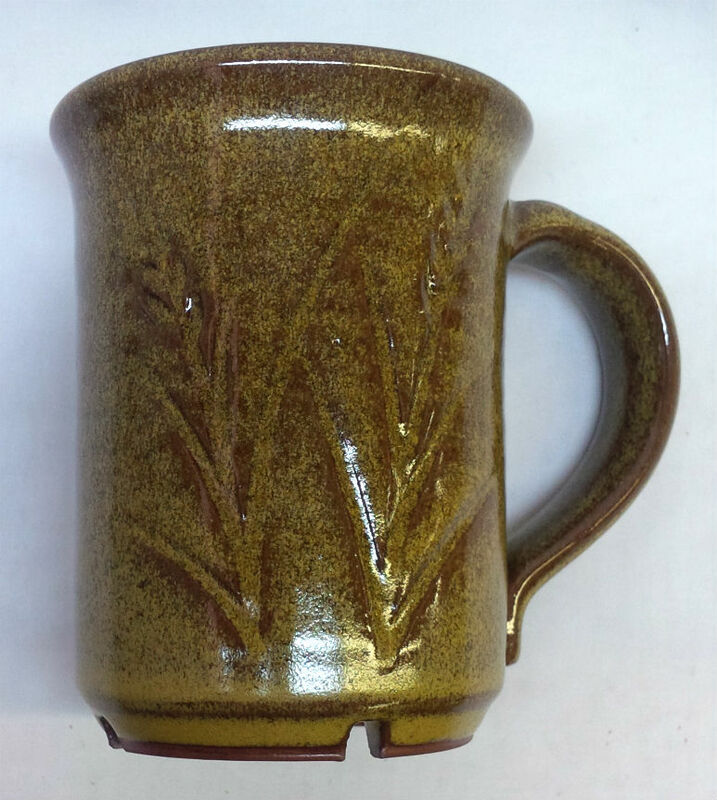 Purely decorative highly crystalline glazes are almost always high in Na2O and thus almost always craze badly. A dramatic example of crystallization can be demonstrated by melting (and cooling) a powdered mix of 50:50 Ferro frit 3134 and cobalt oxide in a crucible at cone 6. The frit is a very active melter (it contains no alumina) and the cobalt is also an active melter, together they can work real magic! 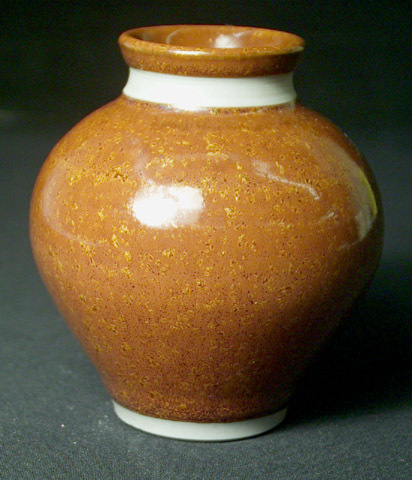 Several things are needed for high silica glazes to crystallize as they cool. First a sufficiently fluid melt in which molecules can be mobile enough to assume their preferred connections. Second, cooling slowly enough to give them time to do this. Third, the slow cooling needs to occur at the temperature at which this best happens. 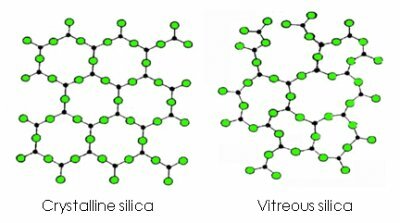 Silica is highly crystallizable, melts of pure silica must be cooled very quickly to prevent crystallization. But Al2O3, and other oxides, disrupt the silicate hexagonal structure, making the glaze more resistant to crystallization. This glaze has a significant amount of cobalt carbonate and during cooling the excess is precipitating out into pink crystals during cooling in the kiln. 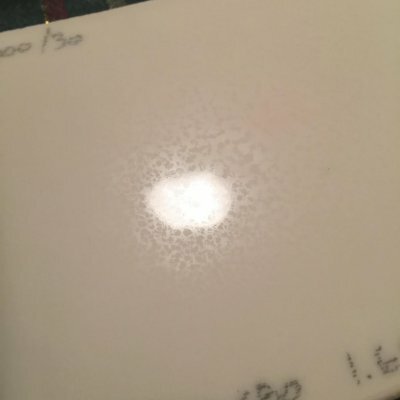 This effect is unwanted because in this case since it produces an unpleasant surface and color (the photo does not clearly show how pink it is). 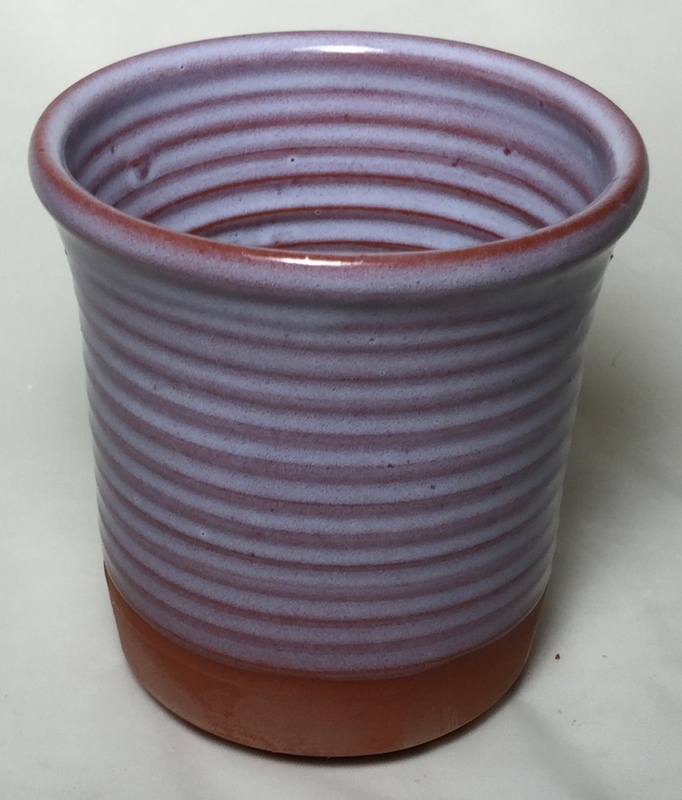 This problem can be fixed by a combination of cooling the kiln faster, increasing the Al2O3 content in the glaze (it stiffens the melt and prevents crystal growth) or firing lower. GA6-A Alberta Slip base glaze (80 Alberta Slip:20 Frit 3134) fired with Plainsman slow cool cone 6 firing schedule on Plainsman M390 iron red clay. If this is cooled at normal speed, it fires to a glossy clear amber glass with no crystals. Each potter using Tenmoku has their own preferences about how the glaze should look. Ron clearly likes the iron crystals to develop well on the edges of contours. He has learned how to walk a delicate firing and recipe balance to achieve this effect. If the percentage of iron is too high, or the glaze is applied too thin, reduction is too heavy or the cooling too slow there will be too muchy crystallization. 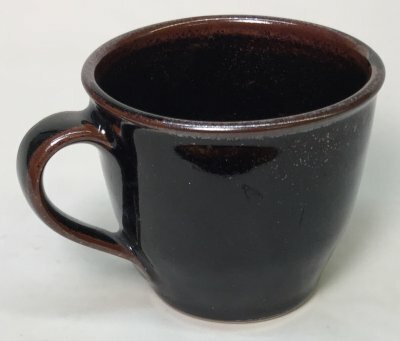 If the iron is too low, cooling is too fast or the glaze it too thick it will be a solid black. 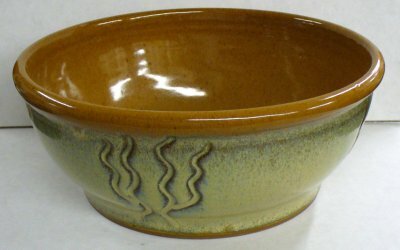 Additionally, this effect depends on a glaze having a fluid melt (the iron is a strong flux), if the glaze is too thick it will run downward during the firing. 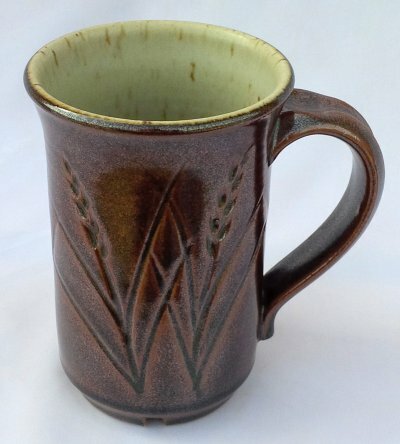 A good matte glaze. A bad matte glaze. 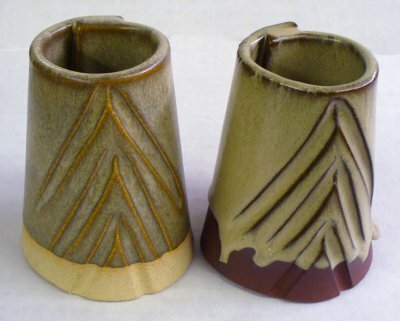 A melt fluidity comparison between two cone 6 matte glazes. 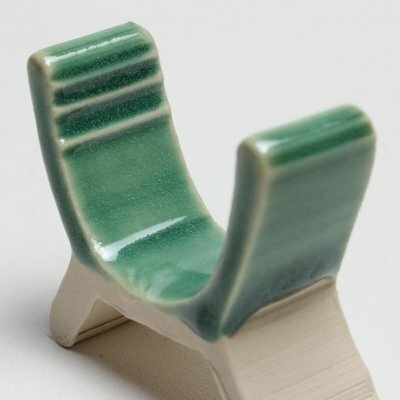 G2934 is an MgO saturated boron fluxed glaze that melts to the right degree, forms a good glass, has a low thermal expansion, resists leaching and does not cutlery mark. G2000 is a much-trafficked cone 6 recipe, it is fluxed by zinc to produce a surface mesh of micro-crystals that not only mattes but also opacifies the glaze. But it forms a poor glass, runs too much, cutlery marks badly, stains easily, crazes and is likely not food safe! 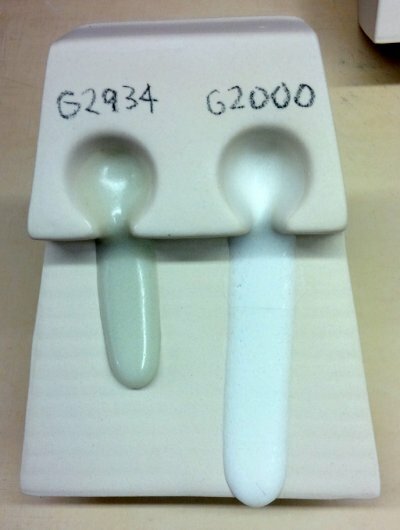 The G2934 recipe is google-searchable and a good demonstration of how the high-MgO matte mechanism (from talc) creates a silky surface at cone 6 oxidation the same as it does at cone 10 reduction (from dolomite). However it does need a tin or zircon addition to be white.